Renovated to high standard and opened July 2013, old country cottage. Sitting in it's own securely fenced garden with it's own private use heated semi in ground swimming pool. Fitted out with new quality furniture and appliances. Two and a half bedrooms, One double and the second double bedroom having a third single bed around the corner of a chimney breast which gives privacy for both beds. Upstairs bathroom with toilet, sink and small bath. Downstairs bathroom with shower toilet sink and bidet. WI-FI to the whole of the property and garden. Satellite Free View UK TV. Lounge seating for 6 in leather three piece suite. Seating for 6 around the dining table in the kitchen. Outside 6 seat quality patio dining set and 4 loungers, all with cushions and barbecue. Games books and videos provided. Cyndi and I have now moved permanently to France to run our small holiday business. Our aim is to not only provide great accommodation, but also be on hand to ensure guest s have all the information about the local events and attractions whilst they are staying with us, to ensure that they have a great holiday experience. Liberte Bosquet Gites, are perfectly sited just 5 minutes drive, 30 minutes walk from the beautiful chateau village of Jumilhac Le Grand and only 12 minutes drive from Saint-Yrieix-la-Perche, which has all amenities that may be required 6 supermarkets, hospital, restaurants, shops, markets and cultural events and entertainment. Both of which are not overly commercialized regarding tourists, but at the same time very welcoming to foreign visitors, which tend to be either Dutch or English. We have developed the grounds with an eye for both a natural environment as well as total privacy, making it perfect for those who do not like to be in public view whilst enjoying the lovely weather. The upstairs bathroom offers a bath, toilet and wash basin. Downstairs bathroom offers a shower, toilet, bidet and hand basin. The large living room has comfortable leather sofas, coffee tables, TV, DVD player/CD player, wood burner. There are four golf courses within an hour's drive of the cottage. Golf Domaine d'Essendieras, 9 holes par 36 - a new course at St. Medard d'Excideuil. La Porcelaine Celiroux Golf Club, 18 holes par 72, 6 km north east of Limoges. St. Lazare Golf Club, 18 holes par 73, 2 km south of Limoges. Golf public de Perigueux, 18 holes, par 72, Marsac sur l'Isle, 2 km. west of Perigueux. Outside: Very private secluded garden, sunny south facing aspect, with plenty of shade from an old walnut tree, parking, barbecue, 4.4 meter semi in-ground private pool. Utility Room: Washing machine, fridge freezer, ironing board, iron, cleaning items, sink with storage under. Cleaning / Towels / Linen / Maid service: All towels for both shower and swimming along with all bed and kitchen linen are included in the holiday price. All linen/towels are changed weekly. Other: In the Bread oven room there is a large selection of books, board games and toys for all age groups. We had a great week with Phil & Cyndi in their gite. They were most helpful, very knowledgeable and most importantly a good laugh! We shall be returning to stay with them when the opportunity presents itself. Thanks for a cracking holiday guys! See you soon. Thanks again for the opportunity to stay at your beautiful place. Very clean and tidy lovely garden and pool , great place to stay with your dog . Thanks again we will be back soon. A lovely gîte in a stunning location with wonderful hosts. We can't thank Phil and Cyndi enough for all their kindness during our recent stay. Our holiday was severely disrupted by family illness back in the U.K. but they were so supportive and helpful. Sadly we were only able to stay a few days but we really loved the cottage and its tranquil garden. The cottage was clean,well equipped and provided everything you could possibly need. We would have no hesitation in recommending the gîte for anybody looking for a fabulous place to stay. 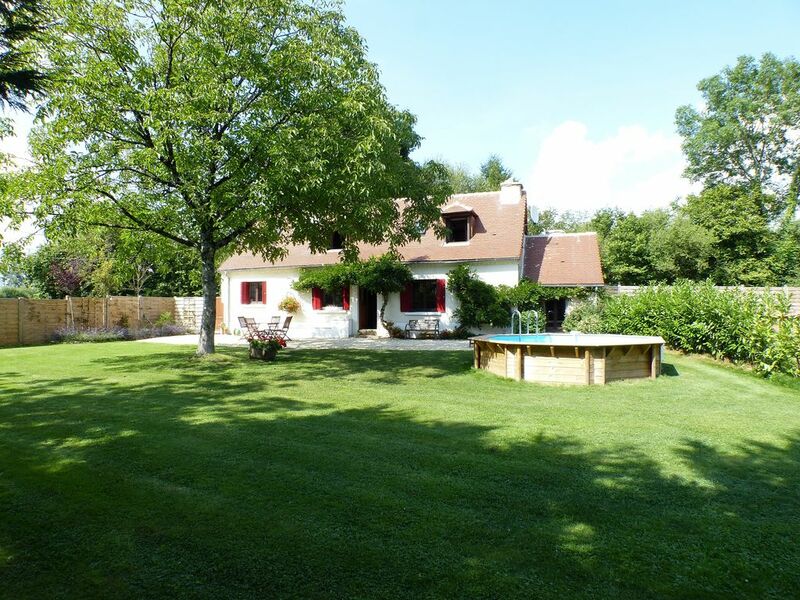 A lovely gite, superbly equipped. Cyndi and Phil were wonderful hosts who made us feel very much at home. Nothing was too much trouble for them and they went out of their way to make sure we had a great holiday. We particularly enjoyed the doggy safe garden which meant we were able to allow our dog, Eddie, to roam knowing he was safe. Tracey, Austin (our Labrador) and I have had a lovely fortnight in the Liberte Cottage. Beautiful setting and superb location to tour the region from. The Cottage is spacious and extremely well kitted out. Nothing is too much trouble for your hosts Phil and Cyndi. If you're new to this area I do recommend that you take the time to sit with your map book and Phil for advice on things to do and places to visit. Thank you guys for a lovely holiday! Best accommodation we had ever used!! Phil and Cindy are very friendly kind and helpful owners. Whenever I emailed him, Phil's response was very prompt. He tried his best to meet our needs. Our child has a very sensitive skin and he can't go to swimming pool so Phil ensured that the level of chlorine is as small as possible during our stay. The wipers of our car were broken but he himself checked it and took us to the nearest garage. When my husband lost his wallet ( or it was stolen? ), Phil kindly wrote a letter in French so that we could ask police to write a crime report. His suggestion about where-to-go was very helpful as well. The accommodation itself is also great! The old stone house is lovey, clean and cool even on the hottest day. The garden is large and beautiful. The swimming pool was awesome especially for us who live in Scotland where there is no outside swimming pool! We definitely recommend this accommodation!! The beautiful landscape of hills and valleys in the close vicinity are perfect for walking, bird watching and cycling and there are many lakes and rivers offering good water sports such as swimming, canoeing and fishing. There is also a municipal tennis court which is free to use on a first come first serve basis, in Jumilhac Le Grand. Numerous lake beaches in the area, all supervised during July and August. Easily accessed by car and plane. Ferry Ports: Calais 7-8 hours, Caen/ St Malo 6-7 hours. Airports: Low cost flights to Limoges 45 mins drive away from the cottage, Bergerac 90 mins and Bordeaux 2½ hours. Please note that a car is essential - hire car facilities at all above airports. The property is in a small rural hamlet, within 30 minute walking distance of the picturesque village of Jumilhac Le Grand with its fairytale 13th Century Chateau, restaurant, bars, shop, butchers, chemist, 2 bakeries, etc. and just a 10 minute drive across the Haute Vienne border to St-Yrieix-la-Perche which has numerous shops, supermarkets, restaurants and bars, a fortnightly market, night market, and cultural events throughout the year. There are well marked trails around the village and chateau. The River Isle flows through the valley surrounded by woodland and is a great place to admire the local flora and fauna. There helpful tourist office which can advise you of many things to do in the area, but also visit the tourist office in St. Yrieix la Perche as that covers a different area. There is a municipal outdoor swimming pool 3 minutes drive down the road, open July and August with views of the countryside. St Yrieix la Perche has 2 hypermarkets and several large supermarkets stocking everything you might want to make your holiday enjoyable. It has a quaint old quarter and is a typical French town. There is a regular traditional Friday Market and every Thursday evening during July and August is the ‘Marche Nocturne’, where you can sit and dine, enjoying local produce being prepared for your dinner, and live music. If you want to enjoy the local cuisine there are many good restaurants to choose from. In July and August, St Yrieix hosts a classical music festival. The surrounding area offers fishing, canoeing, walking, cycling, horse riding, golf, swimming, gold panning and tennis. There are beautiful villages and towns to visit such as St Jean de Cole, one of the 'plus beaux villages' in France and Brantome, known as the Venice of Perigord Vert. There are many fascinating chateaux to visit and explore. Visit the historic caves at Grottes de Villars and Lascaux. At Arnac Pompadour you can see the French National Stud stables and a beautiful chateau. Segur le Chateau, another ‘beau village de France’ was featured in the ITV programme called ‘Little England’. For longer days out, the attractions of the River Dordogne are about 90 mins away with Sarlat and Domme and other places to visit. Booking Notes: We would like a £200 deposit to secure your booking. Then at least 8 weeks prior to departure, the balance should be paid in full together with a returnable deposit of £250 to cover any breakages etc. Cancellation within 10 weeks prior to departure will require full payment due to difficulty in finding alternative tenants. Please ensure that you have travel insurance in place when booking in case of illness. Changeover Day: Changeover day is on a Saturday, we ask that guests vacate by 10am and new arrivals to arrive after 4pm. Consideration is given to out of season bookings with regards to dates and times. Notes on prices: Prices displayed are for occupancy of two persons. Additional guests will be charged at a rate of £50 per person per week. Please see our website for full terms and conditions.